I’m working on a new manuscript set during the Great Depression in Canada. The exploratory process of writing (for me, the weft) is threaded through the warp of reading – be that primary documents, oral history, my family history, or secondary sources. Sometimes I’ll catch myself. My writing style can change in response to whatever I’m reading. A chiding interdepartmental memo from 1936 on ‘sub-marginal lands’ elicits austerity and submissiveness; a bleak personal history will leave my words equally bereft; a newspaper article extolling the virtues of ‘poor man’s land’ might have me cheering and piling on the adjectives. I’ve come to realize that it is not the words or the subject matter that I’m responding to. In all of these examples, the subject matter is more or less the same. I am responding, quite simply, to the tone of the work. Tone, as noted here in the blog Daily Writing Tips, is “what the author feels about the subject.” (This is different from voice, which is the author’s personality.) The authorial attitude toward subject of the penned work – do they like it? Support it? Hate it? Abhor it? Embrace it? Fear it? Look down on it? Love it? – infuses the word choice, the pace, the arc of its narrative, its tone. So the first lesson, as a practicing historian, is a reminder to think about and (if possible) try to identify an author’s tone, whether it be a primary or secondary source. In the case of the newspaper editor trying to either stem the tide of vampiric bleeding of the countryside where people up and ‘walked out’ of the Great Plains dirty dusty dryland region in droves; or the counterpart newspaper editor wooing those same dusty Great Trekkers to move to the local burgeoning settlement, the tone amps up the volume and moves the words from mono to stereo. Trekkers who moved offer two tones as well. There are those whose experiences were worse (if possible) after the move; there are also those who built thriving lives in new places. Understanding the tone of the source author underscores and directs how I interact with and use these words. But there is a second lesson, and that lesson is for me, as a writer. Working on the Great Depression, I am of course reminded of Bill Cronon’s seminal piece, “A Place for Stories: Nature, History, and Narrative.” The way we, as writers, choose to tell a story, matters. This point was brought home to me in spectacular fashion this week as I read through Curtis McManus’ recent book Happyland: A History of the ‘Dirty Thirties’ in Saskatchewan, 1914-1937 (University of Calgary Press, 2011). I was alternatively delighted and dismayed by his prose, his perceptiveness and perception, and ultimately, by his tone. McManus argues: we have to divorce the Great Depression from the ‘dirty thirties.’ The dryland region of the so-called ‘Palliser’s Triangle’ was opened for settlement in 1908. The region was immediately struck by droughts in 1914, 1919-1924, and 1929-1937. These three connected droughts, in his book, become a “singular historical event with its own causes, courses, and consequences; it has its own history, nature, and trajectory quite separate and distinct from the Great Depression.” Fair enough, when it comes to discussing drought, environmental devastation and migration out of the drylands. He offers a persuasive point. Alberta today is full of Saskatchewan refugees who argue that they have fled from the province precisely because of this apathy, this belief that Saskatchewan is full of people who persist in accepting the idea that government should do for us what we should be able to do for ourselves. This is a culturally pervasive spiritual habit that developed in the dust storms and soil drift of the dry years (p. 229). The Dirty Thirties implicitly asked these questions: how long can a man retain his pride and dignity and walk with his head up when he is compelled to ask the village council to provide him with underwear? How long can a man resist the all-too-human temptation toward contempt for the man who asks to be supplied with underwear? At its most basic level, the Dirty Thirties was a soul-destroyer. It was also ridiculous (p. 112). While I am not offering a full review of Happyland, the book reinforced, for me, Bill Cronon’s point: the way we view a story shapes how we tell it. 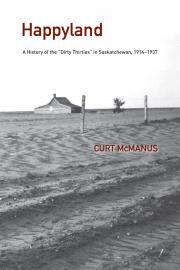 McManus’ tone, the author’s attitude toward the subject (the social and environmental repercussions of opening the Palliser Triangle for settlement), is something akin to: a stupefyingly ridiculous tragedy of massive proportions that has altered Saskatchewan (and not for the good). While I both love and hate this distillation, it got me thinking: what is the tone of my book? What is my attitude toward my subject matter, which in many ways mirrors McManus’ subject? Will I have the same attitude and tone? Why or why not? Embracing and owning my tone, knowing why I’m writing the book the way that I am, is my first fundamental task. It is also yours. What is your tone? Can you hear it?